Tommy Chong is mentioned in Weird Al Yankovic's song "Don't Download This Song" from his new album, Straight Outta Lynwood. The song is about music downloads and one verse says "Don't download this song; Or you might wind up in jail like Tommy Chong". Online magazine, Quirkee, asked Tommy Chong 20 questions. Read the questions and answers here. Fox-TV's new show, Celebrity Duets, achieved big ratings, but mixed reviews for last night's premiere. Here are the opinions on Cheech. "Cheech Marin is genial enough, but has no business singing straight." "Cheech Marin, who would probably come in first in a mumbling/singing contest. One too many puffs on those funny-looking cigarettes may have cost Cheech a singing career." "I'm surprised that Cheech Marin wasn't the first contestant eliminated. Though Cheech's performances left me wondering why he was even on the show, his personality impressed the judges." "Cheech’s singing ability isn’t really mentioned by any of the judges, which is a good thing for him, and even Brady slips in a “Dave’s not here” reference." "Peter Frampton's first partner, Cheech Marin, was not so great, but not so bad that everyone would jet to the bathroom if he sang at a karaoke club. Frampton himself was just okay; the real star on the stage during their duet was the shirt he was wearing, which featured a huge bat lifting up a skull." "Cheech Marin and gymnast Carly Patterson should be the next to go." We still stand by our opinion that Cheech was super-nervous and that his true voice will come out if he relaxes. Tonight, Fox-TV premiered Simon Cowell's Celebrity Duets. Some of the celebs, such as Lea Thompson and Lucy Lawless, came on stage with great confidence and a strong singing voice. Others, such as Cheech Marin and Carly Paterson, seemed a bit nervous their first time out. Cheech had the chance to perform with Randy Travis and Peter Frampton. He survived episode #1. If he begins to relax in future episodes, his true voice should shine through. All of the judges, as well as host Wayne Brady, are apparently huge Cheech and Chong fans. Their comments were more about his Cheech and Chong notoriety than his singing. If he was on stage performing with Tommy, they could easily sell out a stadium. Everyone is aching for a reunion of these comic geniuses. We've posted video clips of Tommy Chong speaking at The I Chong book tour. Warning: These files are VERY BIG so allow time for each to complete. Each requires Quicktime 7.0 or higher or a player that plays MP4. Cheech Coming To "Morning Invasion"
LOS ANGELES, Aug. 28 /PRNewswire-FirstCall/ -- Latino 96.3 FM, a Spanish Broadcasting System station, was 'Invaded' yesterday by "Latin King of Comedy," Joey Medina. Medina joins "The Morning Invasion" with Nico Jones on Latino 96.3 FM. The show airs Monday through Friday, 5:00 a.m. to 10:00 a.m.
Joey Medina is one of the top Latino comedians in the country. He is also a veteran of many television shows and feature films, including "The Original Latin Kings of Comedy" and "Latin Palooza". He will now use his finely honed comedic talent to entertain the largest Hispanic listening audience in the country in Los Angeles. Causing a stir with his debut on Monday, he is truly in his element with the 'The Morning Invasion' and the English-Spanish delivery of this popular morning show. Joey Medina will celebrate his radio debut with a LIVE Broadcast on Thursday, August 31st at the Laugh Factory at 8001 W. Sunset Blvd, Hollywood, CA. Joey and Nico will be joined by guests Cheech Marin, Paul Rodriguez and others to help kick off the new radio morning show. Press event at 10:15 a.m.
Spanish Broadcasting System, Inc. ("SBS"; Nasdaq: SBSA) is the largest publicly traded Hispanic-controlled media and entertainment company in the United States. SBS owns and operates 20 radio stations located in the top Hispanic markets of New York, Los Angeles, Miami, Chicago, San Francisco and Puerto Rico. The Company also owns and operates Mega TV, a television operation serving the South Florida market, and produces live concerts and events throughout the U.S. and Puerto Rico. In addition, the Company operates LaMusica.com, a bilingual Spanish-English online site providing content related to Latin music, entertainment, news and culture. The Company's corporate Web site can be accessed at www.spanishbroadcasting.com. Source: Spanish Broadcasting System, Inc.
We've posted a list of signing dates for Tommy Chong's book, The I Chong: Meditations from the Joint. See "current events" on the right. Scarface, the video game based on the classic movie, will hit stores October 8th. 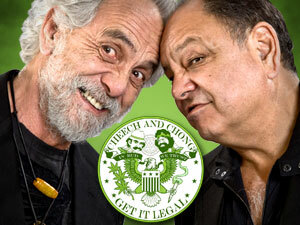 Cheech Marin and Tommy Chong provide voiceovers for the game. The PS2 version of the game is special edition which includes interviews with Cheech and Tommy. Si TV, the English-language, Latino-themed production company, is developing a comedy named Stuck In the Middle. Not much more is known about the series, except that they have received a vocal commitment from Cheech Marin. Fox-TV has posted a photo of the celebs participating in their new show, Celebrity Duets. Cheech is seen wearing some sort of latino-influenced black outfit. He appears to have lost a lot of weight. Either that or Photoshop slimmed him down. The show will premiere on a one-time-only special night with a two-hour episode Tuesday, Aug. 29 (8:00-10:00 PM ET live/PT tape-delayed) on FOX. The CELEBRITY DUETS performance show will have its time period premiere Thursday, Sept. 7 (9:00-10:00 PM ET live/PT tape-delayed). The location of the next leg of Cheech Marin's Chicano Visions art exhibit has been announced. It takes place November 18 thru May 1 at the Museum Of Art in Fort Lauderdale, FL. The exhibit is currently in San Francisco. Thank you very much to John for providing his acount of Tommy Chong's book signing at Book People in Austin, Texas. Tommy was in excellent spirits and really kept the crowd laughing. He gave his take on meeting Cheech. Sporting a black t-shirt that read "Hemp is an herb. Bush is a dope.," Chong seemed very relaxed and confident as he transferred his wisdom into a very receptive crowd. I would estimate about 150-200 people were in attendance, and Tommy did no Q+A. Overall, the experience was a happy and long-awaited moment for me, and I walked out of BookPeople with a smile on my face and an easy mind knowing that men like Tommy Chong still stand up for what they believe in. If anyone has any photos or stories about the Chicago and Texas & The I Chong: Meditations From The Joint" book signings, please send them our way. FREE T-SHIRT IF WE USE YOUR STORY! We've been seeing a lot of articles wondering why Cheech Marin would be on the Fox-TV show, Celebrity Duets. It's because he can actually sing! You can't tell during the screams on Earache My Eye, but he really does have a beautiful singing voice. When we spoke to Tommy, he confirmed this as being true. Tommy Chong wrapped up the NYC leg of his "The I Chong: Meditations From The Joint" book tour with a visit to Jim Kerr on Q104.3. -Tommy finally got the publishing back from Motown for the song he wrote while in The Vancouvers, "Does your mama know about me." The lawyer that represented Smokey Robinson in his divorce represented Tommy. -Still gets big royalty checks for movies such as Nice Dreams, but gets checks for 48 cents for Corsican Bros. He said he throws those checks out. -Tommy hope's he and Cheech will reunite. Thinks Cheech may need the money after he's finished with his divorce. -Tommy made an odd statement. "Cheech will have to compete with Shelby if they reunite." Cheech Marin has begun a press tour promoting the Cheech Marin and Friends DVD, his comedy tour and the Fox show Celebrity Duets. Tommy continued his NYC press tour today. -Waiting for this interview to start was tedious because they were busy doing(stealing) bits that Stern did already. ie the educational video on homosexuality and the homeless game. -O&A sabotaged the interview with Tommy because they were upset that Chong did Stern first (yesterday). This was confirmed by insiders. -They said Tommy should be thrown in jail for a couple of the movies he made. They were complete DICKS to him. -Interview lasted under five minutes. They said they had to go to a commericial and then kicked Tommy out. -They pretended like they didn't know the name of the book even though Simon & Schuster explained everything to their producer. -Tommy made it sound like Cheech was the only one that wanted to reunite. He said it's because Cheech needed the money. -During yesterday's press tour, Tommy said the Corsican Brothers didn't make much money because the film studio, Orion, went bankrupt during production. Today, he said it was because there was no dope in it. Cheech didn't want to do anymore movies with dope. I'm sure both were factors. Chris Jericho (WWE World Champion), actress Lucy Lawless (“Xena: Warrior Princess,” “Battlestar Galactica”), actor Cheech Marin (“Cars,” “Nash Bridges”), 2004 Olympic Gold Medal-winning gymnast Carly Patterson, actor/director Alfonso Ribeiro (“The Fresh Prince of Bel-Air,” “All of Us”), Jai Rodriguez (“Queer Eye”), actor/comedian Hal Sparks (“Queer as Folk”) and actress Lea Thompson (“Back to the Future,” “Caroline in the City”) are the eight celebrities who will compete weekly on CELEBRITY DUETS premiering Tuesday, Aug. 29 (8:00-10:00 PM ET/PT) on FOX. Wayne Brady will host the show. Each week, the celebrity competitors, as long as they remain in the competition ñ will be paired with a different recording superstar among Grammy Award-winning and No. 1 artists Clint Black, Michael Bolton, Belinda Carlisle, Taylor Dayne, Peter Frampton, Macy Gray, James Ingram, Wynonna Judd, Chaka Khan, Patti LaBelle, Kenny Loggins, Richard Marx, Brian McKnight, Aaron Neville, Smokey Robinson, Randy Travis, Dionne Warwick, Lee Ann Womack and others. In addition, legendary producer David Foster will serve as a judge for the weekly singing competition. Additional recording superstars and other show participants will be announced. After each performance episode, viewers will vote for their favorite celebrity performers, with the outcome announced live on the weekly results show beginning Friday, Sept. 8 (9:00-10:00 PM ET live/PT tape-delayed) on FOX. The celebrity with the fewest votes each week will be eliminated from the competition. The winning celebrity will emerge from the competition in perfect harmony, and a $100,000 cash prize will be donated to the charity of his or her choice. The trailer for the upcoming low-budget, straight-to-dvd film, "Evil Bong" has been posted. There is also a review about how bad the director is. This evening, Tommy signed books at Bookends in Ridgewood, NJ. Other than the lack of air conditioning and the crying babies, the night was fantastic. Bookend's management was very organized resulting in a seemless event. There were approximately 150 attendees. Tommy Chong was, once again, very relaxed. He discussed the book like he did the night before, but included more improv. There were a couple guys from Maine there that had heard about the signing on the Howard Stern Show. They made the nine hour trip to get there. None of us had eaten so Tommy, two representatives from Simon & Schuster and myself, the Weedmaster, decided to get some dinner. Walter, one of the owners of Bookends, recommended a place down the street named Joel's Malibu Kitchen. The food was excellent. Sorry, I don't mean to sound like a restaurant reviewer, but Joel gives the patrons personlized attention. He's a super nice guy who used to be a chef in Malibu. Everything we had was superb. As you can tell from the photo, they write your name on your plate with tye-dyed garlic mashed potatoes. Dinner was pleasant The reps from Simon & Schuster were beautiful. Dinner allowed me the opportunity to ask Tommy some questions. Despite what Stern thought, Chong really hasn't slept with any celebrities. He did say, however, that Cheech has dated a few. Tommy said he'll probably tour with the Marijuana-Logues play in the future, but his primary focus is touring with his wife, Shelby. He was not allowed conjugal visits in prison. Each prisoner was allowed a certain number of points. Each point can be used for a visit (non-conjugal). Tommy saw in a LA Times that June Fairchild, the comedian that played the Ajax Lady in Up In Smoke, is homeless and an alcoholic. She was the person responsible for coming up with the name Three Dog Night. She was dating one of the members of the band. I asked Tommy if he has any full length video of C & C doing stand-up. He said the only thing he has is Perform. Perform is an out of print video which originated on Betamax. You can find bootlegs on ebay. When asked if there's another book in the future, he said there is. He gave me some information, but asked me not to report it yet. Doing so, would compromise the project. When he was in prison, he had bronchial problems caused by hay fever. When he was released, Danny Masterson from That 70s Show recommended taking a lot of vitamin C and various holistic approaches. This eliminated Tommy's problem. After dinner, we said goodbye. They were heading back to NYC. Tommy has some press in the morning before flying to Chicago. Tommy arrived shortly before 7PM and began speaking at 7:15PM. During the 45 minute discussion, Tommy spoke of his wrongful persecution and what it was like being in prison. Most of this can be found in his book. He also included additional stories and anecdotes. Tommy looked super-relaxed and was very well-spoken. Everyone in the 300+ audience was captivated by his wise words. Much of what he said focused on the bible and religion. Tommy then began taking questions from the audience. We asked him about how he told EW that he's currently working on what will be "one of the biggest-grossing movies ever in the history of the world." He said it will be the "Passion Of the Christ" of comedies. He said he couldn't provide any additional information at this time. All in all, it was a fun night. We met a lot of great people. Court TV's Hollywood Heat was filming this for inclusion in their show on Tommy which should air Thurs, August 24th. We have video of his entire intro, but will wait until after the book tour is over to post. Don't want to ruin the suprise for people. For the next three days, author Tommy Chong is in NYC promoting the release of his book "The I Chong: Meditations From The Joint". We'll be providing complete coverage. -His wife Shelby invested in and made a lot of money from real estate in Toronto. -Regarding reunion with Cheech, "you can't get a rich mexican to work". Cheech has moved on. He's working with Don Johnson now (reference to Cheech portraying a cop on the tv series Nash Bridges). -By far, his best appearance on Stern. -Wore shirt "Hemp is an herb. Bush is a dope." -Claims George Bush, Jr's jumpiness indicates he's doing coke again. -Claims George Bush, Sr's hand motions during a debate with Clinton indicate he did coke before the debate. -Reagan's speech writer whom Tommy did time with, claims Reagan smoked pot. -Arnold Schwarzenegger has smoked more than weed. -Tommy still makes pipes as a hobby. -He got stoned with George Harrison on multiple occasions. One time George was on one side of him and Tony Dow, Wally from Leave It To Beaver, was on the other side...all smoking. -Smoked pot with every Beatle, but Paul. However, Lennon was on the other side of the room so they technically weren't smoking together. -Tommy gave Cheech the bongs the feds didn't take. -Son's girlfriend is niece of Eric Idle. Eric's play, Spam-A-Lot, made Tommy decide to write a play based on Up In Smoke. Play name: "Pipe Dreams." Claims that after Cheech heard this, Cheech decided he'd do the same thing. -When they were still together, Cheech would give Tommy some ideas for a movie, but Tommy would do the actual physical writing. -They broke up because Cheech felt guilty about the way Mexican's were portrayed in their movies. Tommy knew it was over when he went to see Cheech one time. One of Cheech's people told Tommy that Cheech was having a meeting with members of the hispanic community and asked Tommy to wait outside. -Leno wouldn't have Tommy on to promote the book because he had already had him on before he went to prison. -Will probably go back on tour with the Marijuana-Logues when the book tour is over. -Audio of interview can be found here. -Wants to come out with skateboard with his face on it. -Jay Thomas has known Cheech and Chong since the 70s. -Jay told old story about when he and his wife were entering the limo with Cheech and Chong. Cheech made a joke about clearing some space for her to sit down. Cheech still uses that joke. In fact, we think it's the joke Cheech uses in Up In Smoke when the blonde gets into the back of the green van. -Apparently, Jay Thomas is good friends with actress Edie McClurg. Edie played the queen in The Corsican Brothers and Gloria's mom in Next Movie. Jay had her on the phone. Tommy got Edie to reveal that she flashed both he and Cheech while on the set of The Corsican Brothers. -Tommy spent approx $200,000 on legal fees. -Other celebs in prison: 2 football players, 1 baseball player. -New Line Cinema didn't want to do director Larry Charles' $30 mill reunion script so Chong wrote one while in prison. Cheech wouldn't read Chong's script because he didn't want to be subservient to Chong. -The DVD for a/k/a Tommy Chong will be released in November. -Very short interview. Nothing new was discussed. On Thursday, outlaw, actor and huge Cheech and Chong fan, Bobby Capps, was at Book Passage in Corte Madera, CA to cover the Tommy Chong book signing for us. The police claim that pot heads are all morons and stupid. They're not. Give a pothead some weed and he turns into F-ing MacGyver. Potheads can make a pipe out of anything. See this microphone? Put a hole in the end and whifffffffffffffffff!, it's a pipe!, said Tommy before beginning the signing session . These words made for an enjoyable evening with the celebrity Pope of Pot who charmed the emotions out of a sea of fans. "There's the pitch swung on and hit and the crowd goes wild here in the Book Passages Arena ladies and gentlemen", said Tommy before beginning the signing session . As the event unfolded, anticipation and impersonations of Cheech and Chong comedy routines were performed by Cheech and Chong local loyalists . Dave's Not Here! Hey man, I got the stuff! I watched and listened as I felt I was there on a bigger mission. To find out first hand from the Mannnnnnnnnn himself just what was going to be the next move or movie. A crowd of more than two hundred people filled the events room. I, myself, was mesmerized by the beauty of Terri, the Events Coordinator. She works for the owners, Bill & Elaine Petrocelli. In the style of Cheech Marin himself, I was like whoaaaaaaaaaaa! She makes me want to go out and read a book. Terri did a great job. She and several co-workers posed with the Master of Marijuana at the end of the night. Terri came in and with a genuine awe introduced the man of the hour. Tommy Chong took the stage. Tommy began by telling anecdotes of life in the 60's, being half White and half Chinese and how he met Cheech Marin. I tried to stay unbiased, but caught myself time and time again being lulled by the melodic tenor voice of Tommy Chong's soothing style. Tommy's voice cracked here and there. For an instant, I could see relief of pain and almost a tear drop breaking from the man's heart. Shortly after the signing began, some guy burst in ranting and raving about how he was a eye witness for the Amber Schwartz Garcia kidnap/murder and how the City of Martinez Calif had a restraining order against him to stay away from the courts. His claims were that an innocent person was behind bars and that somehow George Bush senior was somehow connected. we were here for a special event, we were glad to take his fliers, but we had to move on. I informed the employees he was not a part of the show and they immediately escorted him out of the building. The crowd spouted off. We're here for Tommy Chong. We want Tommy! We want Tommy and giggled as they saw the man leave. He told stories of how Ronald Regan was once HR Puffin Stuff. With jokes of Bush and the state of the world now Tommy could only point over and say, "This is why I wrote this book. I needed to let you know that there's a reason for everything. If you're in prison, you need to be there. You can find out what and why you are on this planet. I wanted to write a book about Cheech and Chong, but I couldn't. There's stuff Cheech and I did that he and I don't want people to know. Basically, take away that and there's just a boring story. We made a movie we did some stand up. I needed to be there he proclaimed. I found myself and I'm now free!" As the night moved on, a Q&A from the audience was brought forth. After the autograph session was over, people lined up around the corner to greet Tommy. One-by-one they moved in on the man, telling him thank you Tommy Chong for all the fun and laughter you have given us over the years. Shaking the man's hand and requesting a photo. The love for the man was etched on their faces like the works of Michael Angelo's "David" to stand the tests of time. You could see that every single person wanted to hug the stuffing out of the white hair Teddy Bear. Chong still fights with a passion. His obsession to write and create and be are instilled in every wrinkle. He wants to share his gift with you and let you know that the government will never break him down. Tommy shuffled out of the building just behind Frank Lauria with me right behind. I could see Tommy's frame in the dark of the night move across the parking lot to Frank's car. Now, I can smile because I see that Tommy has found inner peace from a horrifying ordeal. It made me feel warm all over knowing that the stars had realigned. God wanted it that way and now so did I.
Cheech and Tommy, please put aside the petty differences. Let's have one more movie for everyone around the world whom love you both. As I got in my truck for my midnight journeys ride home, I saw my own face in the rearview mirror. It seemed that I too had grayed during all the troubles for Tommy Chong. My worries for the man I didn't really even know or share much life had branded me with the mark of Chong. My head had salt and peppered and my beard was tinseled with white hair also. I had earned my colors for being a believer and standing up and fighting for Tommy and his family. Somehow, I feel vindicated for all my hard work. I hope that the next time I see Tommy, he will be working on the next Cheech and Chong film. Hopefully, Tommy will give me a part like he had mentioned. If it never happens, I will be just as satisfied as I have met and loved THE CHONG pioneer of taboo comedy creator of unconditional laughter! Q: Tommy What attributes your long success as a couple with Shelby? A: Well, we were never official, So we could never officially break up. Q: Do you read the Cheech and Chong web site? A: Yes I do from time to time! Q: If you could say something to the many loyal fans around the world whom read the web site what would that be? A: Thanks for the support Don't give up the fight! Q: What caused the actual split up with you and Cheech? Q: Will Shelby be joining you on the book tour? Q: What caused the disturbance between you and Josh the Director of AKA Tommy Chong? A: He was trying to stiff the investors and me. Greed basically. Photo of Stonerdude (the guy that designed the Free Tommy shirts/the guy that's often on Stern) at the San Fran signing. We accounced last week that we had "The I Chong: Meditations From The Joint" T-Shirts to give away. Well, thanks to the good folks at Simon and Schuster we now also have books to give away. Same rules apply. Anyone who purchases anything from this site from 05.01.2006 thru 08.31.2006 is automatically entered to win an autographed "The I Chong: Meditations From The Joint" T-Shirt or book. Each separate order counts as (1) entry. We will try to get the books autographed when we see him this week, but no guarantees. The Book Standard inteviewed Tommy Chong about his book, The I Chong: Meditations From The Joint. I'm not sure if he was joking or not, but Tommy sayshe's working on a book with his wife called "How to Get Thin and Rich While Your Husband's in Jail." When asked about Cheech, he says "Right now Cheech is getting a divorce, so I try to stay away from him, because he's in a bad mood. Especially when I'm happily married and he isn't. I haven't seen Cheech for almost a year now." What's interesting is that there's always a different explanation as to why he hasn't spoken to Cheech. Tommy also says he will definitely write another book. The outlaw, Bobby Capps, notified us that Cheech Marin will be speaking at Perspectives 2006, September 15th, at the Sacramento Convention Center. Other speakers include Tom Ridge and Bob Dole. Hopefully, Cheech confronts them about Tommy's wrongful persecution. while attending the Metro Chamber's premier business networking event. Salon interviewed Tommy about pot, his experiences writing The I Chong: Meditations From The Joint, and how he no longer gets along with Josh Gilbert, the director of a/k/a Tommy Chong . Tommy said the last time he smoked was a month ago with Tom Green. He doesn't normally share bongs and wound up catching a bronchiolar infection. Tommy Chong's book, The I Chong: Meditations From The Joint, went onsale everywhere today. Chong kicked things off with a book signing at the Virgin Megastore in Los Angeles. People have told us the place was packed with fans looking to get their books signed. He has tons of other signings planned. See "Dates To Remember" on the right. Attendees please send us photos. Cheech Marin was interviewed by "Northern Nevada Lifestyles with Terrie Q. Sayre" while in Tahoe for a golf tournament two weeks ago. We really don't know what was discussed. If you happen to live in Nevada, the show begins airing Aug. 2 and runs Wednesdays and Thursdays, 3 p.m. and 8 p.m. on DCCA TV Ch. 26 through the end of the month. You can also view it at 4 a.m. and 4 p.m. and 9 a.m. and 9 p.m. Friday through Sunday. Additionally, the program runs on Lake Tahoe's South Shore cable access Channel 19 at various times. DVD's of each show are available for $8. Underwriter opportunities are available as well. call 775-450-6248.